Kapunahou, the site of the present Punahou School campus, was given to Kameʻeiamoku by Kamehameha, after the Battle of Nuʻuanu. The land transferred to his son Hoapili, who resided there from 1804 to 1811. Hoapili passed the property to his daughter Kuini Liliha. The decision was made over the objection from Liliha; however Hoapili confirmed the gift. It was considered to be a gift from Kaʻahumanu, Kuhina Nui or Queen Regent at that time. In Hiram Bingham’s time, the main part of the Kapunahou property was planted with sugarcane by his wife Sybil, with the aid of the female church-members. Bingham’s idea was to make Kapunahou the parsonage, and to support his family from the profits of this cane field, selling the cane to the sugar mills, one of which was in Honolulu. Founded in 1841, Punahou School (originally called Oʻahu College) was built at Kapunahou to provide a quality education for the children of Congregational missionaries, allowing them to stay in Hawaiʻi with their families, instead of being sent away to school. The first class had 15 students. The land area of Kapunahou was significantly larger than the present school campus size. While many see Punahou today as the college preparatory school in lower Mānoa, over the years, the school, though based at Kapunahou, also had campuses and activities elsewhere. 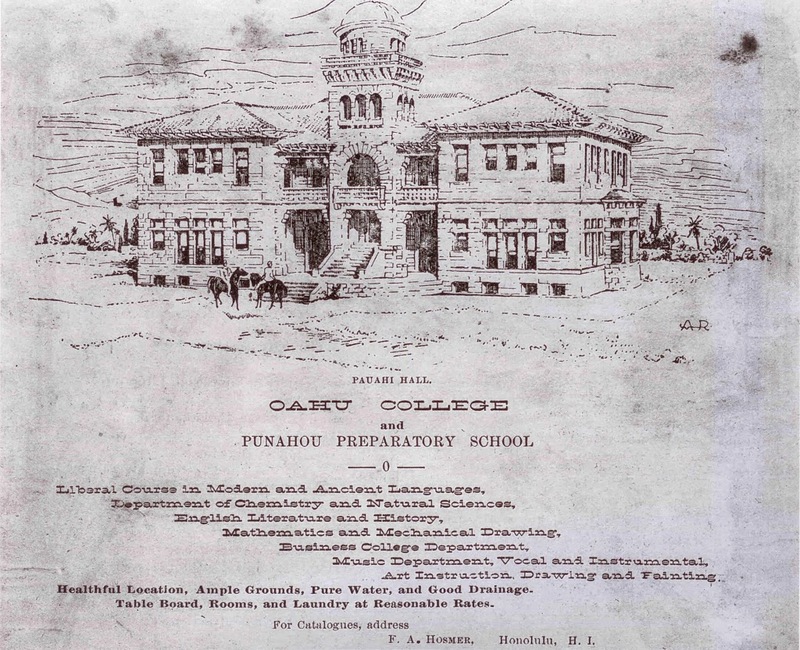 In 1881, at the fortieth anniversary celebration of the school, a public appeal was made to provide for a professorship of natural science and of new buildings. President William L Jones in his speech expressed the need for Punahou to meet the changing times. By the 1898-1899 school year, there were 247 students in grades 1-8 in the Punahou Preparatory School campus downtown. Later, in 1902, the Preparatory School was moved to the Kapunahou campus, where it occupied Charles R Bishop Hall. Near the turn of the last century, the Punahou Board of Trustees decided to subdivide some of the land above Rocky Hill – they called their subdivision “College Hills;” at that time the trolley service was extended into Mānoa, which increased interest in this area. The College Hills subdivision, the largest subdivision of the time (nearly 100 acres of land separated into parcels of from 10,000- to 20,000-square feet,) opened above Punahou and became a major residential area. The image shows an Oʻahu College Advertisement from 1895. In addition, I have added other images in a folder of like name in the Photos section on my Facebook and Google+ pages.